Actravia is a far more cost effective solution for event registration than many of the online services out there who can charge in excess of 7.5% of fees for a booking, as well as charging additional booking fees to your clients. With Actravia you keep CONTROL over your cash and data and you are liable only to pay the fees of your payment gateway. Believe it or not, some online event registration providers will hold on to YOUR funds until after your event is completed, depriving you of critical cash flow and exposing you to the risk that funds will be delayed or withheld. Turn your website into a powerful booking management system. Make collecting cash on the day of your event a thing of the past, leaving you free to concentrate on meeting, greeting and getting things organized. Manage all your registrations in one place which you can access from anywhere. Handles complex grouping & category requirements, ideal for private colleges, membership organisations and sporting associations. Great for website frontend - no more pdf registration form downloads or multiple phone calls to secure bookings. Capture details and payments online instead immediately. Ideal for back office in-house use as well - escape the tyranny of multiple versions, lost, locked and out of date attendee spread sheet & database files. 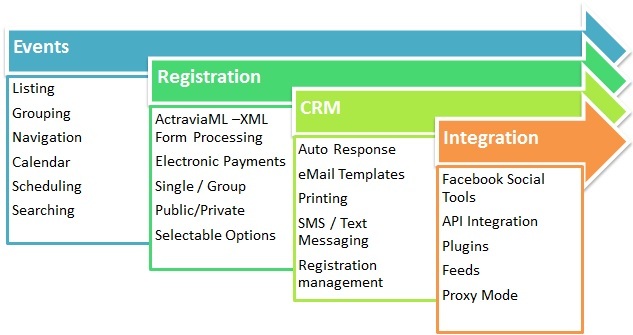 Great for value added resellers & developers to implement and customize. Handles diverse registration requirements under one platform. Regular updates and extensions – future proofing your investment . Double up - with Actravia in form mode using ActraviaML, Actravia can also act as a stand alone form application. No need to purchase separate event listing and forms module. Extend your web presence into Facebook with our Facebook app integration tools.